This old dog is still learning new tricks, and the sunshine still shines on his posterior from time-to-time. Saturday was the day after “THE DAY” that will live in infamy as one of the most windy non-storm driven days since dinosaurs roamed Denton County. I read on a thread somewhere, last Friday night, that Lake Ray Roberts had seven foot swells that day. Now, rather than perpetuate a rumor, with no visual aids, I can believe we could subtract three from seven and be in the ballpark of what winds whipped up last Friday. Seriously. There were also stories of boaters stranded on leeward sides of islands waiting it out, tents blown away, and a general wearing down of human patience for being buffeted about. Shaun and I have been trying to get together to fish the northern feeder creeks for some time now, and it seemed natural to go to him since that’s his back yard. Anyway, Shaun was very happy about the Johnson Branch location, and thought it would weather any residual wind well, and had plenty of room for the estimated 85 kayakers to show and tell Saturday. What didn’t cross my mind, at that time, is that we were not only in his back yard, we were essentially in his own personal aquarium. 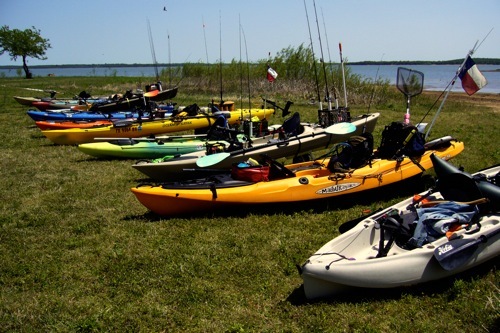 Backtracking a bit – This was a kayak fishing tournament that has been in the planning stages for months with a lot of the organizing taking place through threads on TKF the Texas Kayak Fisherman forum and on a thread on TFF – Texas Fishing Forum’s site. It was a “Heros on the Water” benefit tournament and was put on by Josh Neumeyer who set up a facebook page specifically for this event – HOW Benefit Tournament & Family Kayaking Day. THe tournament was a catch, photograph and release tournament with best five fish in the bass devision counting toward total inches. 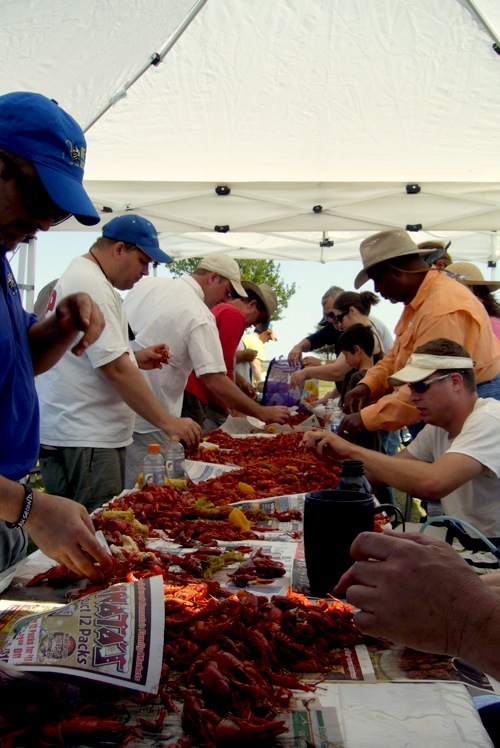 Prizes from Bass Pro, Chris from Mariner Sails, and of course yours truly with a fly rod two Diablos and conventional partner in crime Austin Anderson aboard his Chupa Cabra, were added to a mix that included boiled crawdads, corn, sausage, gumbo, fun and games for all ages – literally. Saturday began early, with a 5:30 registration, and the youthful exhuberencapsdfasdf of Austin, better known to some as “Pondbass,” lead us to be there at 5:30, exposed to a little breeze and no crowds whatsoever. The little breeze, coming off a 50-plus miles-per-hour wind day was welcome, but the early shortage of entries was not. We could only guess that the wind had taken a toll on people’s wills, trees, yards and fences. I haven’t seen an official wrap up of the event, but eventually it appeared to be about 40 entries were there fishing on what turned out to be a fantastic day. After a good churning of the lake, by winds that were off the charts, and a good dose of, “does the weatherman really know,” our strategy was simple; Head for the nearest coves that would have been protected from the wind, and just go cove, cove, cove … until we hit on something. If the wind kicked on again, at least the coves would shelter us somewhat. The cool air and 64-degree water that greeted us at sunup simply added to the variables, and if you are a regular reader of Texas Fly Caster, you know what I think about variables. So, instead of employing the wisdom of learning from my first tournament with Chris Weatherley on Lady Bird Lake, and following someone who knew the area, and talked about what he knew about the area, we went for the long ball. It was over before it ever even began. LESSON 1 (again) – Talk and listen to everyone you find before the tournament starts. The guy closest to that location has probably fished the most, and he probably knows the most. Wake up, and follow HIM! Austin and I hit most of the coves just west of the Johnson Branch peninsula, and shared them with a boat bass tournament and occasional kayak competitor. I had my big box of bass flies, and went big to try and catch big right off the bat. That didn’t work. So, while Austin was pounding the water in every direction, I gradually moved down the food chain to smaller and smaller Clousers. Two fish for a total of fourteen inches were all I could do. I caught the first one, laughing as I saw him launched into my hand, overmatched to the extreme, by an eight weight rod. Austin Anderson, aka “Pondbass.” Keep your eyes on this guy. We pulled out all the stops, to no avail. I would estimate we covered five miles within site of Johnson Branch, and Austin came back empty, and I came back bashfully with fourteen inches of fish – that’s two fish totaling fourteen inches. I was laughing and talking to Josh Neumeyer about my success, and he said I was the only one who had caught anything to that point. The tournament ended at two, but we were in at noon to show the Diablos to crowds beginning to gather for lunch. “OK, then let me go get the memory card!” For a brief moment, I was in the lead, a fly fisher in a kayak bass fishing tournament. That was until Shaun Russell came back to base. Just in case I didn’t foreshadow this enough, we were in Shaun’s house, Shaun loves his house (named Johnson Branch) and Shaun loves his aquarium. So, while I was bellyaching about the location in prior days, the total inability to be a roadrunner (leave for another location and get back in time), he was quite supportive of, and positive about Johnson Branch. I am no good at math, but two and two were beginning to be put together by me. How about you? He was brilliant. I haven’t seen the final results, but my fourteen inches actually held on to third place, and it was one of those days for most everyone. How else could you explain a kayaker with a fishing rod placing in a kayak bass fishing tournament? I walked away with $60., a new scale and fillet knife and was happy as a school kid. LESSON 2 – In a catch-photograph-release (CPR) tournament always, always photograph every fish. If there was a bigger one later, especially on an obviously bad day, those little guys could put you in the money. Shoot ’em all and let the judges sort ’em out. I gave $20. to Austin for his wisdom, and pocketed the $40. to break even on the entry fee. Shaun, well he cleaned up, and rightly so. There’s a nice picture of him with a huge check for $220 and he deserves every penny. Maybe we can relocate this tournament, say to Isle Du Bois park next year just to keep it interesting. 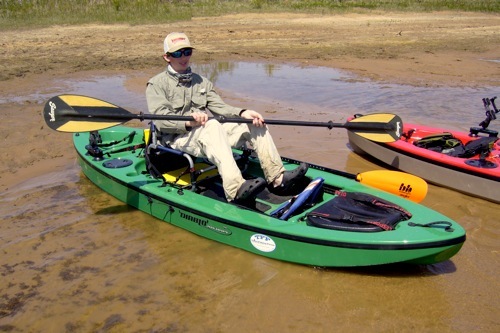 Regardless, I will be tying my kayak to Shaun’s and he can just tow me from corner to corner of his aquarium. I wouldn’t mind a bit. This was a great event, one that’s small enough, yet big enough, to be a good starter for someone interested in fishing tournaments, and kayak fishing tournaments. The people attending were outstanding, friendly and helpful. The food was fantastic, and both Austin and I had fun showing the Diablos and taking folks for rides on them. You will never see the photographs of the fish I caught. Some family members may be receiving a fine new fillet knife, or a scale for Christmas, so BE NICE to me. Thanks to Josh Neumeyer who was handling all the technical aspects of the tournament. He may have had help, and I encourage anyone reading to add names of those that should be mentioned in connection to this event (That’s why we have comments below folks.). What a great event. I got to meet a great group of men and women while being out there competing in the tournament. Between the awesome cooking, learning how to set up my kayak, and playing kayak games (that someone had to be half lit to dream up), it will be an event to remember for a long time. I’ve only been kayaking for a year now so it was great to see how others have set their kayaks up for fishing. I had the pleasure to have a young vet (Jeremiah), tag along with me as I fished. He ended up catching a very nice bass and more importantly had a great time being out in a kayak just fishing. I learned a lot from him. It had nothing to do with fishing or kayaking, but instead how a person can be effected by war and how long it takes for them to let it go. I gained a tremendous respect for Jeremiah, and all the men and women that have made such a sacrifice for our freedom. They have great fishing there as well. I didn’t however fish at Johnson Branch during the tournament. With the crazy strong winds leading up to the tournament it totally blew away any game plan that I had of fishing there. I chose instead to be a roadrunner. I went to a different area of the lake that was not as effected by the extreme winds. I was able to make use of the winds and found an area where the winds were pushing shad around a corner that the bass (All be it small) were taking the opportunity to feed. I was truly blessed to get the few bass I was able to get to the kayak that day. It was tough fishing. Real tough. I was so surprised when Josh called my name as the winner of the tournament. Well, I kept the rod & reel combo and gave the $220 back to H.O.W. After spending time fishing with Jeremiah it seemed a small contribution to a wonderful organization supporting those that give so much for our freedom. I look forward to fishing future H.O.W. events. If any of you are on the fence about fishing with a vet I can tell you first hand it will be time well spent! !